Local couple's baby girl arrives on Jan.3, winning gifts in the Pioneer's First Baby Contest. Judith Vazquez and Juan Ruiz welcomed their daughter, Ynez Ruiz, as the first baby born at St. Charles Madras in 2019, on Jan. 3, at 3:19 a.m. Weighing 7 pounds and 15 ounces, Ynez joins her brother Reynaldo Ruiz, 1 1/2, as the second child in the Ruiz family. 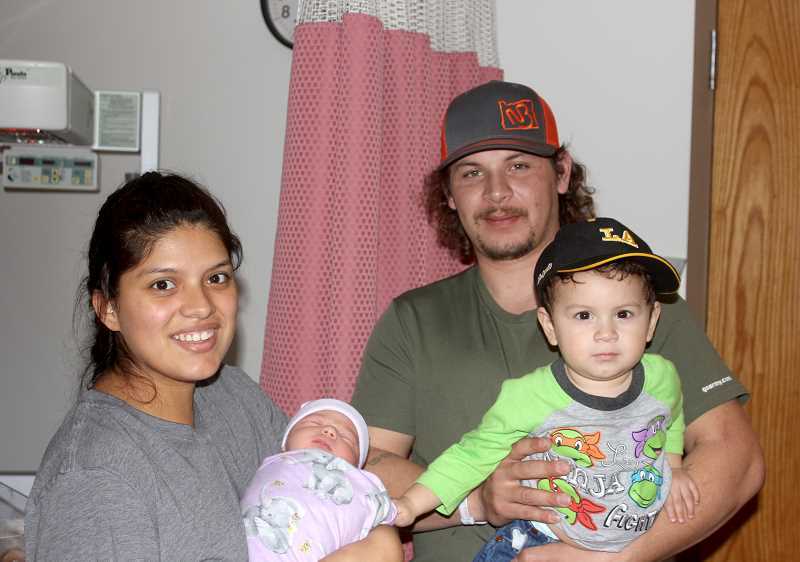 The Ruiz baby was the first of four babies born within five hours at the Madras Family Birthing Center, after a period of nearly two weeks without a single birth, which the Birthing Center said is an uncommon and long amount of time to go without a birth. However, they did say that it is common for births to come in groups, like the four that occurred on the morning Ynez was born. Vazquez said that she cried when she found out they were having a girl because she was so excited, also mentioning that Ruiz was slightly more indifferent. "As they start growing up, I think it will be a little different (raising a girl versus a boy)," she said, mentioning that she is really looking forward to all of the pink things that are at home in the closet for her new baby girl. For Vazquez, waking up in the middle of the night to care for her children is a big challenge, she said. "That was like the hardest thing to do, but other than that I love everything; it's worth it." "Their smile when you see them, when they are sleeping and they are hugging you," she said, that is what makes the hard times worth it. Vazquez and Ruiz are looking forward to having more children in the future, but Vazquez said she needs a break for a little while. Ynez, as the first baby born in the new year, has won her parents a list of prizes donated by local businesses, as New Year's babies do each year. The list includes a pizza from Figaro's Pizza, a baby gift basket from the Hummingbird Junction, a free dinner at Black Bear Diner, a baby blanket from The Outpost, a $25 gift card to Grocery Outlet, a 10-visit punch card from Madras Aquatic Center, a can of formula from Erickson's Thriftway and a one-year subscription to the Madras Pioneer.